PLANO, Texas--(BUSINESS WIRE)--Jan. 29, 2019-- Cinemark Holdings, Inc. (NYSE: CNK), a leader in the motion picture exhibition industry, announced plans to build an amenity-packed, 14-screen theatre in the new Cottonwood Creek Market development in Waco, Texas. Located at the intersection of I-35 and Loop 340/Hwy 6, the theatre is part of a 143-acre, master planned, mixed-use center developed by NewQuest Properties and is scheduled to open in the spring of 2020. 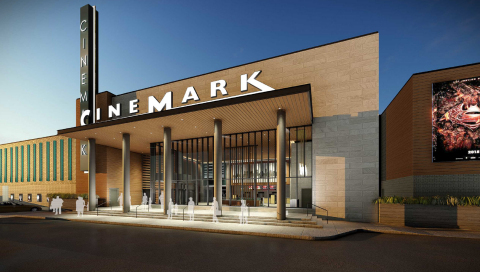 “We are proud to work with our long-time partner, NewQuest, to bring the Waco community the ultimate moviegoing experience with our new Cinemark location coming soon to Central Texas,” said Mark Zoradi, Cinemark’s CEO. “With our Luxury Lounger recliners, XD auditorium and more, Cinemark will give guests the opportunity to enjoy the newest films in one of the most innovative viewing environments." A concession stand brimming with popcorn, an assortment of beverages and fan-favorite candy brands. In addition to the new Cinemark theatre, Cottonwood Creek Market will offer an impressive lineup of trendy restaurants, entertainment and a variety of retail shops in its 285,000 square feet of space covering 63 acres. The center will also include multifamily homes and office space. Stay connected with Cinemark at cinemark.com and through Cinemark's social media channels at Facebook, Twitter and Instagram (@Cinemark or #Cinemark). For more information on construction progress for Cottonwood Creek Market and the Cinemark theatre, visit www.newquest.com. With over $2 billion in assets, NewQuest Properties is a market leader in retail development, leasing, asset management, land brokerage, investment sales and tenant representation throughout Texas. NewQuest Properties facilitates every aspect of retail leasing and development with its in-house architecture, construction, marketing and property management teams. For more information on NewQuest Properties, please visit www.newquest.com.